Last weekend I was painting at the French Broad River Park with a local outdoor painting club. So, over the next couple of weeks I’ll be sending out a series of 4 emails, each featuring a handful of plein air landscapes for your viewing pleasure. 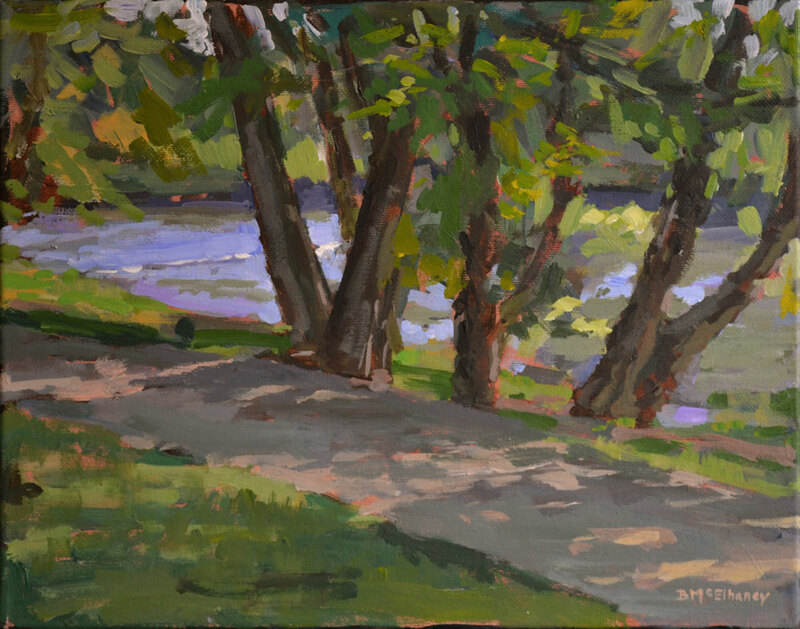 Path at French Broad River Park, acrylic on canvas, 11 x 14 in. What makes plein air paintings special? While an artist is painting directly from nature the sun moves and clouds may pass overhead causing changes in lighting. These shifting factors encourage quick and accurate rendering of the scene. Paintings done en plein air tend to be direct and essential with more energetic brushwork. Painting outdoors can be frustrating but it is a valuable exercise for any painter and the results are often surprising and insightful. Most of the landscapes in this collection have not been shown anywhere before (not even on my website). This is an exclusive preview just for members of my “Collector’s Circle”! If you haven’t already, I invite you to join my “Collector’s Circle” and get free email updates. As always I’d love to hear from you! Feel free to leave a comment below.